One represents the country borders and another one is administrative boundaries. Both are of global coverage covering the whole world. Both tables have spatial indices on the geometry columns. My goal is to find what countries are not fully covered by the administrative boundaries and, if feasible to achieve within a reasonable time, the location/geometry of part of country geometry where it is not covered by the administrative boundaries. 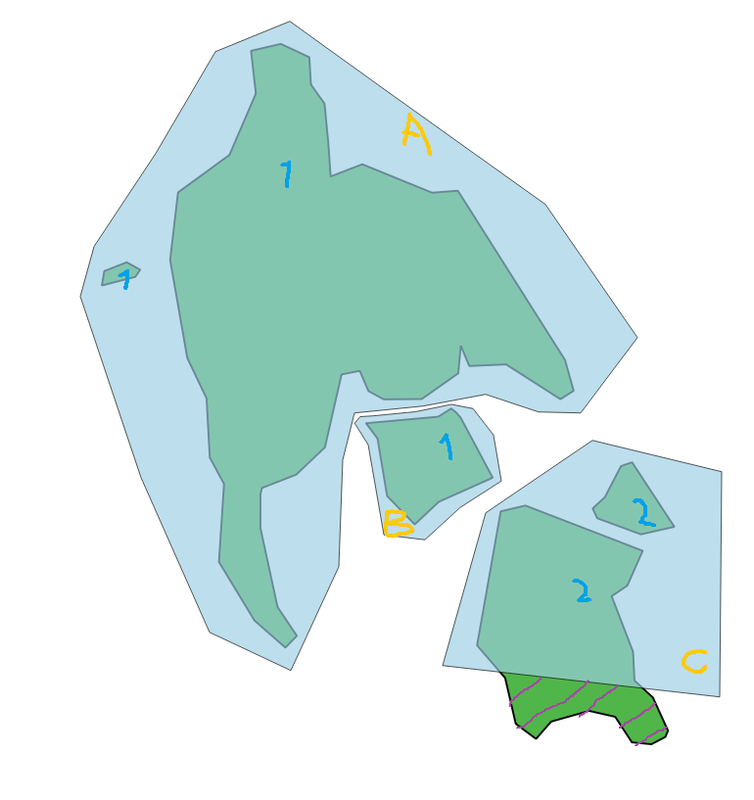 Two countries (marked as 1 (consists of three polygons) and 2 (consists of two polygons), dark green polygons (two rows in table in this case). Three admin boundary polygons (marked as A, B, C) (can be multipolygon/polygon), transparent blue polygons (three rows in table in this case). Country 1 is fully covered by the admin boundary A and B. Country 2 is not fully covered by admin boundaries (C), so I would like to get this reported. If possible, the hatched area of country 2 could be reported as well. This sounded like a job for ST_Difference function however my problem is that it is just too slow running on the global dataset. Running this SQL query on Singapore takes 4 seconds. This is because I have just a few admin boundaries located around the country which I've extracted beforehand and I use only single country geometry. I get the results I expect. Running the same query on a larger country, such as Indonesia, took 15 hours, so there is something wrong with this approach. I was trying to play smart and get into the analysis only those admin boundaries that intersect the boundary box (envelope) of the country, but it still was running for 10 hours for Indonesia. It is acceptable if this query would take a few days to run as long as all countries could be analysed in this time. 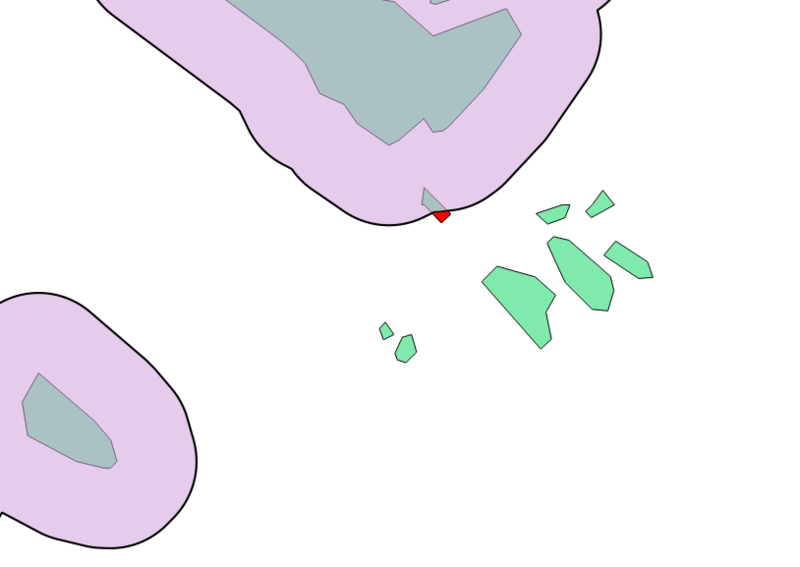 How should such a query be written, if possible in PostGIS? I am open to solutions that involve other tools and software, it does not have to be done solely in PostGIS. does not report those country polygons that are located fully outside of admin boundaries, that is, they do not intersect any admin boundaries polygons at all. The bright green polygons should have been included along with the tiny red part of the country polygon that was included due to intersection with the admin boundaries polygon. Run this on simple Polygons in a new spatially indexed table and use a LEFT JOIN and according CASE to get and handle geometries that don't intersect. I also included a WHERE filter on GeometryType to exclude empty GEOMETRYCOLLECTION from ST_Difference. Not the answer you're looking for? Browse other questions tagged postgis postgresql spatial-analysis st-intersects st-difference or ask your own question. Is there a dissolve function in PostGIS other than st_union?